Some of the best Italian artists of the XV century appeared into the Chapel of San Brizio turbulent history. The first was Beato Angelico, whose work was too slow, though. Therefore, he was sided by some young artists, such as Benozzo Gozzoli, but he stopped working in some month's time. 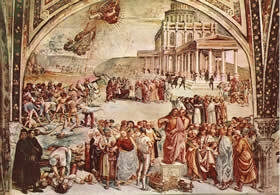 In 1500, an agreement was finally reached with Luca Signorelli. The chapel, built between 1406 and 1444, is set on the right wing of the Orvieto Chatedral transept where there were also the sacristy and a semi-cylindrical small chapel belonging to the Monaldeschi family. It rises near the chapel of the S.S. Corporale that was built in 130 to preserve the relic of the Bolsena' s miracle. Beato Angelico, with the collaboration of Benozzo Gozzoli and Pietro di Nicola Baroni, carried out two of the four gores of the vaults as well as the decorations on the lateral bars. Luca Signorelli finished this work in five years' time, from 1499 to 1504. The Chapel of San Brizio, or Cappella Nova, was built in a time of profound artistic and political changes. This period of political change, characterized by the slow and symbolic shift of power from Florence to the Roman papacy, was about to be sided by an aesthetic renewal. Therefore, the work by Luca Signorelli, who was born in Cortona in 1445, bridges these two periods. He was one of Piero della Francesca's pupils and he became well-known for his ability and for the use of perspective and the attention towards anatomy which was typical of the Renaissance artist. Just in Orvieto, he carried out the work that made him famous, namely the cycle of frescoes dedicated to the themes of the Apocalypse and the Last Judgement: the "Storie dell' Anticristo", the "Finimondo", the "Resurrezione della Carne", the "Dannati", the "Eletti", the "Paradiso" and the "Inferno". In 1579, a marble statue, the "Pietà" by the Scalza, was put inside the chapel. It is not there anymore, while it was only in 1622 that the chapel took the name of San Brizio, namely when the ancient altarpiece with the effigy of the Madonna della Tavola, or Madonna di San Brizio, realized between the XIII and the XIV centuries, was carried there. In the XVIII century, Bernardino Cametti created the altar of the Gloria, a late-Baroque work that substituted the tabernacle of the Assunta. In the same period, the grave of the Cardinal Nuzzi was put inside the chapel, but it was later removed and the Cappella della Maddalena was renovated. Since the first half of the XIX century, numerous restoration works have been carried out and they were finalized in the last years with the creation of a new system of diffused lighting coming from below.